For the last several decades people have had to visit the DMV and take a number. Then wait in line and finally fill out paperwork to get license plate information. This is now an antiquated means of getting license plate number information. With the advent of the internet and online databases, license plate information can now be obtained online. With our simple form you can perform a free license plate number lookup with a license plate number or VIN number from the convenience of your laptop, tablet or smartphone. The free license plate lookup results may include the year, make and model of the vehicle, if results are found. Additional license plate, VIN and vehicle information is available in our member’s area if you decide to sign up. Some restrictions apply and not all license plate searches are guaranteed to have results. You can sometimes find limited license plate owner information, vehicle information, vehicle history report, vehicle description and other related public records. You can also find safety and recall information when you visit the NHTSA website. With online license plate resources you can save yourself the trouble of visiting the DMV and waiting in line. The only draw back to online database resources is most of them are for reference only and if you need official documentation then the DMV will still be your best option. See our Free DMV Finder and Free DMV Driver Request Forms below. If you have the license plate number of a vehicle you can also find the VIN number with our online license plate lookup. This is a good means of identifying and verifying any vehicle you lookup. A VIN number will give you the make and model, manufacturer, body style, engine, year and much more. The VIN number is a 17 digit code that will allow you to verify every detail of the vehicle in question. A free license plate number lookup can also give you safety and recall information about a vehicle. To do this you will want to use your free license plate lookup results (mentioned above) and visit the NHTSA.gov website and search for safety issues or recall information related to the vehicle in question. To lookup a VIN ( or Vehicle Identification Number) you must agree to the terms and conditions of our VIN lookup first. Then enter the 17 digit alpha-numeric code you can find on your dash board, engine block, registration and/or door frame. You do not need to enter a state when using our VIN lookup tool. Make sure to enter all the numbers and letters carefully, one misplaced or missing variable can cause the VIN number lookup to fail. We do not support partial VIN numbers so you must enter all 17 digits for the VIN search to work. A tag plate number search is synonymous with a license plate number search. Often times tag plate number is what people are looking for which is British in origin, where a license plate number is an American term in origin. So tag plate number and license plate number are the same thing. It’s more common for people on the east coast to say tag plate where on the west coast of the United States, license plate is the common terminology. In either case you can perform a tag plate number search with the license plate number and state of registration. Every vehicle that is registered in the United States has a tag plate number as well as a VIN number, which are the key identifiable numbers that both describe the vehicle specs and vehicle registration information. It is possible to sometimes find limited license plate owner information online, as other relevant vehicle information that can be helpful in understanding your vehicle better, or when purchasing a used vehicle from someone. Remember to use the information you obtain in our license plate lookup responsibly and it is illegal to harass or intimidate anyone with the information you find. Please search responsibly. To search a license plate number you will need the full license plate number and the state of registration. License plates have the state listed on the plate itself. Once you have the full plate number and state you can search and lookup vehicle information, vehicle specs, possibly owner information, VIN number. You can also use the VIN number to lookup vehicle recalls and important safety information from NHTSA.gov. Learning how to search license plate numbers can be an important factor when researching your own vehicle or looking up information about potential used vehicles you’re interested in purchasing. I can login to my account! Metsbuffalo@hotmail.com is my email, funnyguy12 is my password! And it keeps telling me: oops,there has been an error, please try again! Over and over! Why is that?? Sorry to hear you’re having difficulties logging into the member’s area. Do you still have your confirmation email? This will have your login and password on it. Please note that the password is case sensitive so make sure you don’t have caps-lock on. If you’re still having difficulty logging in I forward this to customer support. You can also get a hold of customer support at 800-859-7375. In some states its not the drivers fault if they hit your dog. Its the owners responsibility. If the dog was at fault for running into the street and the car was damaged who is going to pay for any vehicle damage? That is a good question. It might be in your best interest to document the car license plate number information and report this to the police and your insurance company. It might come down to what your insurance company says and if there is a precedence for this specific situation, which there probably is. If your car was damaged by a dog that ran out in front of it then it would make sense that the owner of the dog has some liability but we cannot directly weigh in on this situation as we are merely a public records repository. Thanks for the feedback but there are actually several reasons you can legally perform a license plate search. If you read our terms and conditions of our license plate search you can lookup vehicle related information from license plate numbers as long as you fulfill the requirements outlined below. For more information on each reason, visit our member’s area to understand these in more detail. DPPA Notice: You understand, agree, acknowledge, and affirm under the penalty of perjury under 28 U.S.C. 1746 that you may only request, obtain, and use motor vehicle records made available through SearchQuarry.com for a purpose authorized by the Driver’s Privacy Protection Act of 1994 (DPPA). To conduct your search, please select from one of the authorized purposes above. If none of the above purposes are applicable, you may not conduct this search. You understand, agree, and acknowledge that your use of motor vehicle records for any purpose other than a DPPA permitted purpose listed above may subject you to criminal fines for non-compliance and to civil liability in the form of a private right of action, including actual and punitive damages, as well as attorneys’ fees. You agree to indemnify, defend, and hold harmless SearchQuarry.com and its officers, directors, agents, employees, partners, affiliates, licensors, and data providers from and against any third-party claims, demands, expenses or liabilities of whatever nature of kind, due to or arising out your violation of the DPPA. I’d like to find owner of VA motorcycle license 952045 that my son found in the street. If you found the physical Virginia license plate you will want to forward this information to the Virginia DMV. If you found the motorcycle then your best bet is to contact the Virginia police. if all i want is the VIN info (make model etc) do I still have to comply with the Drivers Privacy Protection Act. I can’t even get to the login page! It keeps going connection error! If that doesn’t work I would try clearing the cache on your computer. This doesn’t happen often. If that doesn’t work please contact us using this form, you will receive a prompt response. Sorry you are having some difficulty, we will do our best to resolve it quickly. I was under the impression that the owner of the vehicles name would be attached. Someone hit my brand new vehicle while it was parked and unoccupied. There was a language barrier so I was unable to get his name. He does not speak English. Without it his insurance carrier will not begin a claim for me. Yes this webite does provide the VIN but I need this man’s name! Can anyone help me? Yes I do have a police report by that takes “days” to obtain. And as a productive, working citizen I cannot wait days and days. I need a vehicle to get to and from work/ daycare etc. This sounds like an issue that you’ll have to manage with the police and your insurance company. Owner information is not always available with a license plate number search depending on the state. You might also contact the DMV and file a hit and run report. Thanks for reaching out about a license plate number lookup. You can locate vehicle information, VIN number data and possibly owner information online. Below is a link for a our license plate number lookup where you can lookup vehicle records by license plate number or VIN number. Thanks for reaching out and letting us know about the logging in issue. What email address are you using to login and I can look into for you? Also, if there is a specific license plate number or vehicle record I can help you find I am happy to do this. We appreciate you reaching out. Our license plate search is a great value. There is no other service out there that gives you the detailed license plate information that we do. If you cannot find the license plate owner information you can submit a support ticket in our member’s area and someone will get back to you in 24 hours. Just click on the “Help” tab on the left column and enter the license plate number or VIN number information and our support team will gladly assist you. Same guy again the vehicle make and model is a Mazda B 2200 .from a 99 to a 2000 year model white in color he has had it for approximately six to eight years. I appreciate this at this works this will save me a lot of trouble thank. Your concern is understood. Our resources are setup to lookup vehicle records via license plate number or VIN number. Unfortunately we cannot find vehicle information by name. This is something you will need to address with either the impound facility or the police department or the DMV. It sounds like you’ve already tried to contact the police about this to no avail. If you can provide us with the state and county where this car was impounded we can assist you in locating the appropriate agency to locate this impounded vehicle. Again, the police would probably be the best option since this vehicle doesn’t belong to you and the DMV and the impound facility might not divulge vehicle or owner information without written consent from the owner. I would be happy to help you out with a License Plate Number Search. What state is this vehicle plate located in. I would be happy to help you lookup a mechanics lien. I will need the full name and state of residence of the person in question to begin. We have a multitude of free lien records, license plate number lookup, vin number search and much more. Below is a link for a 5 day free trial where you can lookup unlimited records free for 5 days. There is a link below the search box that you click that takes you to the free trial. I have also placed a link below to the Free License Plate Lookup – Free Trial. Looking for a person from the past. I am happy to assist you. If you have a first and last name, state of residence and approximate age I can search our public records database. We also have a variety of vehicle records. You can perform a license plate number lookup, VIN number search and more. I was doing a clean out and found 2 plates from 1929 Maryland plates how could I find out who own these.. I am happy to assist you. Can you supply us with the license plate numbers and we can do a license plate lookup for you. In order to lookup license plate numbers I would need the full plate and state it was registered in. Sometimes older plates that are registered as a Non-Operated Vehicle are more difficult to locate. In this case the VIN number is a good place to locate the license plate information and we can reverse search the license plate number from that. If you can supply us the license plate number or VIN number we are happy to assist you. I want the person’s name that owns the car. I don’t want to join/pay money unless I am guaranteed at least THAT information. Why else would I want to look up a licence plate number? Thank you for your inquiry. There are actually a multitude of reasons that people lookup license plate numbers. If you want to sign up and lookup license plate number information you can cancel and get a refund at any time. There is a lot of information that you can lookup with our vehicle record resources. We cannot guarantee that you will find all the information that you’re looking for and that is why we have a 30 day money back guarantee if you’re unsatisfied. Below is a link for a free license plate number lookup – 5 day free trial. We also have a Free VIN Decoder you can check out. I can certainly assist you with your search. Are you looking for driver records or a vehicle license plate search? If you would like me to look up vehicle records I will need a license plate number & state of registration or VIN number to begin. We also have records for traffic citations, DUIs, police reports, arrest reports, warrants, criminal records and more. I have included a couple helpful links for you below. You can also visit your local DMV to lookup vehicle or driver records. I have also included a link to our Free Nationwide DMV Finder. The license plate number you’re interested in is available in our database. The vehicle is a 2004 Hyundai Tiburon GT / GT Special Edition with VIN KMHHN65F24U128786. If you’re interested in more license plate information please sign up. You must agree to our terms and conditions before receiving any additional information. You can also obtain this information from the Masssachusetts RMV office. I have included a link for a 5 day free trial below. This is not FREE! They will charge you 2.95 they say for 5 days! In addition, they say you can cancel with-in those 5 days or be billed 19.95 a month! Why don’t they just let you have the 5 days for the 2.95, with no catches! BEWARE! We do actually have a free 5 day trial for our license plate search in our member’s area once you sign up. If you click where it says “Click Here To Begin Your Free License Plate Number Search” you will get the first 5 days for free. You can cancel at any time and if you choose to keep your service you will be billed $19.95 per month. All this information is made very clear throughout the order process. If there is any specific license plate or vehicle related question I can help you out with I am happy to assist you. I have also included the link for the 5 day Free trial below for you. I am happy to assist you with a Free License Plate Number Lookup however we don’t handle vehicle registration. If you’re interested in registering your vehicle you should contact your local DMV office. I have included a link to our nationwide DMV finder below. Please reach out if we can assist you with a license plate number search or VIN number search. We have a multitude of vehicle and driver records. I am sorry that you are having difficulties logging into your account. Our service is most certainly not a scam. I will escalate your inquiry to customer service and cancel your account. You might want to check all your email folders to make sure your welcome email wasn’t filtered. Why do you say/advertise it is FREE when it isn’t!!! I put in the plate number and you require $ or a $ubscription for the answer!! Yes, our services are free for the first 5 days and then if you decide to keep your service it’s $19.95 per month. You can cancel any time in the first 5 days without obligation. Please let us know if we can assist you with a license plate number lookup. For this situation you will need to contact the DMV to inquire about a vehicle that you sold and current owner registration information. We don’t have a direct affiliation with state motor vehicle departments so you will need to do this in person and make sure to bring photo ID and as much information, including license plate number and VIN number of the vehicle. Do you guys offer full vin checks with the unlimited search pass that contain the real full vehicle history report? Like the one that come from NMVTIS or where do you get your vehicle data from? Some employees are parking in unauthorized areas of our hospital parking lot. Notices placed on the windshields are ineffective. We would like to use your service for license plate lookup to find out the names of the culprits to give them official notice that they are in violation. Is this a permissible use of your license plate lookup service? If you follow the guidelines that are listed in our License Plate Lookup Terms, when you perform a search, then looking up license plate information is permissible. A copy of the License Plate Lookup Terms is listed below for your reference. You may conduct a motor vehicle records search only for a purpose permitted under the Driver’s Privacy Protection Act of 1994 (“DPPA”), 18 U.S. Code § 2721 et seq., as amended. By proceeding, you represent that you have read and understand the terms of the DPPA, and that you are conducting your search for a purpose authorized by the DPPA. You understand and agree that your use of this service and of the results of your motor vehicle records search for any purpose other than a DPPA permitted purpose may subject you to liability under the DPPA. Vehicle owner information is not always available. You will be required to attest to these statements again in the member’s area prior to conducting your search. As required by the DPPA, we will retain a record of your request, including your name and selected permitted purpose(s). If you can provide some information about your friend we can certainly assist you with looking them up. A name, state and county of residence and age would be most useful. Hi—I read the Driver’s Privacy Protection Act of 1994, but want to confirm my search is within the limits allowed for use. just a family member of the co-signer. As long as you agree to the terms and conditions of the license plate lookup you can obtain vehicle information from a license plate number. Below is a link to our official license plate lookup where you can read and agree to the terms and conditions before searching. Suspicious vehicle in a private community…. vehicle tag number is not registered in our records, but looks to have a vehicle access decal… trying to find out if they live in the community. We can certainly help you out with a license plate lookup. We will need the full license plate number or VIN number to proceed. We have multiple channels to contact us. You can click the cancel button in the member’s area, email us, call us, Facebook us or contact us through this blog. I will forward your request to our customer support and have your membership canceled and refunded. Are you saying you have a stolen vehicle blocking your driveway? If this is the case you should contact the police about this matter. Unfortunately we don’t have an affiliation with the police department or the DMV. We can assist you with an online license plate number search or VIN number search but this won’t help you in your situation. You can use our Free Police Department Finder and Free DMV Finder to locate the relevant agencies to handle your situation. Please reach out if there is anything else we can assist you with. You will need to agree to the conditions of the license plate search before receiving results. You might also contacting the police to file a hit and run report. This man driving this vehicle stole a lady’s purse right off her arm in the parking lot of kroger at Boston road in lexington ky around 8pm on Thursday May 11th, 2017. He is tall, thin build, wearing thin framed glasses with reddish/blondes facial hair. You should contact the police, this is not something we can assist you with as we do not have an affiliation or any relationship with the police department. If you have a question about a license plate search or vehicle records lookup we can certainly assist you. Unfortunately our license plate database resources won’t go that far back. You will want to reach out to the New Mexico MVD Historical Licence Plate Division about this. Our New Mexico license plate resource typically have results for vehicle manufactured in the last 35 years. We can certainly lookup a license plate number to verify the information that is on record. You should also contact the DMV in your area as many times the change of title request is delayed when being processed and can take several weeks before it’s finalized. Looking to get in contact with the owner. We can certainly assist you with a license plate number search however you will have to agree to the terms and conditions before performing a search to find license plate records, owner information, VIN number and more. Click here for a free 5 day trial where you can lookup license plate numbers free for 5 days. If you suspect it’s a stolen car you should contact the police or the NICB for more information about this. We don’t show anything on this license plate record that says its stolen but that doesn’t mean that it’s not. Unfortunately we don’t have any affiliation with local law enforcement. Can a plate that have not been renewed for a few years be ran for information? We should be able to locate the vehicle records for most license plate numbers. We can also perform a VIN number search if that doesn’t work. You will first need to agree to our terms and conditions of our license plate number search and then enter the license plate number and state of registration to proceed. I am trying to get in touch with the person that owns a vehicle and may possible sells it, but I only have the License plate number – can you help ? In order to obtain license plate number information you will need to read and agree to the terms and conditions of the license plate search. There are a multitude of legitimate reasons a person needs to obtain vehicle records or owner information however because of the legal parameters of our vehicle records you will need to see if you are eligible to lookup this information in our member’s area. The other option is to visit your local Motor Vehicle Department to obtain this formation. Unfortunately this is not a situation that we can assist you with. There are a couple of other options you might consider if you’re interested in letting the owner of the vehicle know what has happened. You can leave a note to the vehicle owner describing what happened or you can call the police and have them notify the owner of the vehicle. There are very specific conditions in obtaining vehicle owner information that you can read in our “license plate search” terms and conditions. Please reach out if there is anything else we can assist you with. Just checking my own tag as i will be viewing a 1976 travel trailer for purchase in the next 2 weeks and would like to make sure how this works. If you believe you have a stalker then you should notify the police. If you have the ability to get the plate number or can safely take a picture of the vehicle this will probably help the police track down this potential stalker. We do not have any affiliation with law enforcement so contacting them directly might be your best option. Are you OK? Are there injuries? You should contact the police to file a report immediately if you don’t need to seek medical attention, which is a priority if you are injured from a car accident. Then you will want to notify your insurance company so they can evaluate the car accident. Thank you for the complement. Please let us know if we can assist you with a vehicle records search or locating any public records. Keeps saying it’s free but keeps asking me for my c.c info and wanting to charge me, wth? Parks in reserved parking in a gated community! Senior citizen must pay driver to wait around! It sounds like you should contact the property manager about this parking situation. We are merely a public records website. It is unclear what you are asking specifically. What does “fLagging” mean? We can certainly give you some assistance with a vehicle records search, traffic citation lookup or a license plate search. Please let us know more specifically how we can help. Your best option is to contact the police about any suspicious vehicles. Unfortunately we cannot provide you with owner information. Click here to use our Free Police Department Finder. Unfortunately we cannot assist you with a license plate owner search with the reason you mentioned. Your best bet is to file a police report and let them know what information you gave us. Hi how can I change my license plate number ? To change your license plate number to a new number or to get a custom license plate number, you will need to contact the DMV directly. Depending on what state you live in, the process may vary on how to change your license plate number. How Can I Change My License Plate Number? Your best bet at recovering your vehicle is to contact the police and file a police report. If you have a loJack system or Onstar this will certainly help the police to find your vehicle. Unfortunately a vehicle’s location cannot be tracked by license plate number unless it has some type of tracking system in place. If you want to provide us with your vehicle information we can search our vehicle records database for you. It is possible to find the VIN number from the license plate number. Must find to locate an old friend who is very ill.
You can start by running a Vehicle History Report to see what registration information is available. If you cannot ascertain the last time the vehicle was registered you should contact the Department of Motor Vehicles and request this information. Since they are the managing agency for vehicle registrations they will know, however you will probably need to visit them in person. To find out when a vehicle was last registered, run Vehicle History Report using the vehicle VIN number. The VIN number is a 17 digit alpha numeric code that is unique to each vehicle. If the vehicle registration date is not available then contact the relevant state DMV and request this information in person. Hey i was hit by a dui driver J******* (kkm 1315) and wanted to know the last name of the owner and possibly insurance company? You should contact the police immediately and file a hit and run report with the police and notify your insurance company. Provide them all with pictures, vehicle and license plate information and a detailed description of what happened. You should contact the San Antonio police about a stolen vehicle. Unfortunately we don’t have an affiliation with any state or local law enforcement agency. Your support people are awesome, and clearly have either a) the world’s largest bottle of vodka and an incredible sense of humor, or b) the patience of Job. I just used the site to verify that I had correctly remembered the plate number of a car that I used to own that was involved in an accident, long story. Either way: don’t let the trolls get to you. Thank you for the nice comment, it’s always appreciated. Please let us know if we can be of any further assistance to you. I am not comfortable with my vehicle information, my name or address on your site for the sake of my family. What can I do about this? If you can provide us with your information, name and address and license plate number we can have our customer service team remove your information from our database. This may take a couple weeks to process. It’s unclear what you’re looking for. This is a license plate lookup and vehicle records blog. You may have reached out to the wrong party. We can assist you with public records but we are not involved with the sale or purchase of any vehicle. If we can be of assistance please elaborate. A Hit and Run accident should always be reported immediately to the police and your insurance company. If you are injured you should first seek medical attention. You should report this accident ASAP to the respective police department as well as your Auto Insurance Company. Make sure to give them as much information as possible such as their license plate number, color and make and model of the vehicle that hit you. I’ve been away for a coupe of weeks. I return home and there is a snow covered car in my driveway. I don’t want to call the police, just incase it’s a relative. I’m not sure how we can assist you. If you’re interested in performing a license plate number lookup you must read and agree to the terms and conditions of the search. In order to obtain information about a car that used to belong to you and your father you will need to contact the relevant Department of Motor Vehicles in the state you reside in. Unfortunately we cannot assist you directly with this as we have no affiliation with any state or government agency. IF you feel there is a suspicious looking vehicle then you should contact the police and give them as much information as possible. If you have the ability to take a photo that would also help but please keep in mind that you should only attempt this if you feel that it is safe. You might also talk to your neighbors about this as a neighborhood watch is never a bad thing and can help to police your own neighborhood. If you feel that a vehicle is putting you and your family in danger then you might consider reporting this to the police. The details you’ll want to report might include; make and model of the car, license plate number, description of the driver. Unfortunately the reason you mentioned does not abide by our terms and conditions. Please read the terms of our license plate search carefully before proceeding to perform any vehicle record lookup. Wondering who it belongs to? That’s good news that you reported it to the relevant law enforcement agency. Our recommendation would be to keep contacting that law enforcement agency to follow up on any leads they might have. It is unclear what your question is and how we can assist you. If you feel that you are being put in danger by a person or there is a suspicious vehicle then it’s best practice to report this to the police. Just trying to find out which neighbor parks their car in my grandparents driveway. Unfortunately that does not fall under our terms and conditions to perform a license plate number lookup. You might consider contacting your HOA or the property management company of their home. Thanks for the feedback Chuck, we strive to offer the most up to date detailed vehicle records. Our license plate lookup resources are vetted for accuracy. Please use the vehicle records you find responsibly. I\’m on a Culdesak end street cars from far away recently. We are uncertain what your request is. We would be happy to assist you with a public record or vehicle record search. That being said if you feel that you have a suspicious vehicle in your neighborhood you should contact the police. If you’re attempting to find the registered location of your car via license plate number you will need to contact the relevant DMV office directly. We cannot assist anyone without reading and agreeing to the specific terms and conditions of the license plate number lookup for the very specific reasons listed on our website. There are many limitations to the information in our vehicle record database that you must adhere to and in order to obtain any of the information available in our member’s area it is required that you sign up so that we can verify and validate your request. Some of the license plate information depending on the state and availability of what is listed as public record. Some information obtained in the license plate search might be outdated or incorrect as there are delays or mistakes in the reporting of such to public record databases. Also note that it is illegal to harass or stalk or use the information for illegal purposes. It’s also important to verify the information obtained so that you’re looking at the correct public record for the correct person. Please use the information you obtain in the SearchQuarry.com member’s area responsibly. It is a crime for someone to throw an object at a moving vehicle. If you have the license plate number of the vehicle that threw something at you then your best course of action is to contact the police and file a report. In Oklahoma there are lots of Native American tribes that issue license plates. Can these be searched here as well? That is a good question about Native American License Plates. Typically license plates are issued by the state and are managed on a state level but several Native American Tribes issue and register license plates to member’s of that tribe. That being said, we do not have access to the Native American License Plate information. You will need to contact the relevant Native American Tribe to inquire about a vehicle that has been registered within that Tribal Nation. Native American License Plates in the United States can be issued and registered by Native American Tribes. Some Native American Tribes issue license plates for official use only and some Tribes issue license plates for person and official use. The issuing and registration of Native American License Plates vary with different tribes. 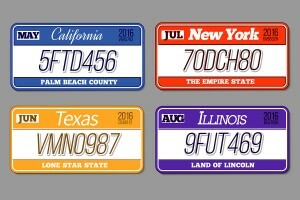 These license plates are recognized by the state and local governments. Hi, I need help to find a license plate. My friend was hit on the freeway and he could only read the plate number but we don’t know the state. Can anyone help? Can you find the tag number by having the owner\’s name address and vehicle type? Unfortunately we cannot access the tag or license plate number of the vehicle by the owner’s name. You can visit the DMV and request license plate information depending on the nature of your request. We are sorry our Free License Plate Number Lookup did not give you the results you were looking for. Your cancellation request has been sent to our customer support team and will be processed today. Can I look up trailer plates? I was given an old travel trailer thats been on my friend’s farm as long as they’ve owned the property. Theres no title or anything, and we know nothing about it. I’m trying to find out as much as I can. Virginia plate, 469-876 Permanent Trailer. I have a small metal tag from a 1946 something. It is 2 3/4 ” X 1 1/2″ , The numbers on it are 1 445587 No other information. I found it out in the desert in Arizona. I have 6 license tags from Ga that are W4RAF years 1954,55,60,62,65, an 66. What does this stand for an what may they be worth. Or who are the family members that they may belong to. Hopefully everyone is alright. As per your request, unfortunately you won’t be able to obtain auto insurance information through a license plate number lookup. You will want to contact the DMV and file a vehicle accident report and request insurance information. You can also notify your insurance company that the at fault party did not have proof of insurance on them. If you received an accident report from the police then you should give that to your insurance company as well. I paid the 14.95 for a report on a vehicle I\’m looking to buy off offer up and the report pretty much offered nothing other than what I already knew about the vehicle (make/model) when will I get a detailed report?? We certainly appreciate the feedback with our Free License Plate Number Lookup and we mention in our terms and conditions that some license plate information might be limited depending on the state where the vehicle is registered and the availability of those public records. We are happy to issue you a refund but please allow a few business days for this refund to be reflected on your bank statement. Where is my report on Florida license plate number 202tpn that I paid for one time of $14.95? Please contact our customer support to find out more about your License Plate Number Lookup. If there wasn’t sufficient information found then we are happy to issue you a full refund. Below is our contact information for your convenience. It’s uncertain why your free trial wasn’t processed for the Free License Plate Number Lookup – 5 Day Free Trial. You can call our customer support team, listed below to help you process your credit card transaction. If you are attempting to report a driver that is driving recklessly or endangering others then you should reach out to the relevant police department and report this vehicle and license plate number. We are a public record website where you can lookup vehicle records and public records online. PLATE NUMBER OR VIN NUMBER. IN NEW YORK, THE DMV IN NEW YORK DOES NOT RELEASE THE OWNERS NAME. We do not guarantee that we will have the results that you are looking for. We only guarantee that you are satisfied and we offer a full money back guarantee if you are not. That being said, you must read and agree to our terms and conditions before using our vehicle record resources. My car was hit in grocery parking lot. A stranger handed me this plate number and said this car hit me. I am trying to find the driver for insurance number. How do I cancel my subscription so I won\’t be charged. Went on here and didn\’t find anything all I kept getting was to keep adding my credit card number and everything and didn\’t get nothing. Please cancel me out. We are happy to assist you with cancelling your subscription and refund any charges incurred for our Free License Plate Number Lookup. Please allow a few days for any refunds to be reflected in your bank or credit card statements. Please reach out if we can assist you with any additional license plate lookup inquiries. Can one look up a license plate# or Vin# if they are interested in buying a used car and want to know it\’s background, or if it has something in its history that will keep it from being insured, etc? If you are interested in finding the history of a vehicle then you will want to run a VIN check or a Vehicle History Report. A license plate search will not necessarily give you the history of the vehicle. Check out our VIN lookup if you’re interested in finding out the history of a vehicle. Can we assist you with our license plate number lookup resources? Are you looking to reinstate old vehicle tags? I sold my 92 blazer k1500 to my brother in law who turned around and sold it to someone else around 17 years ago. I was wondering if it’s still registered. I would love to find it. It was registered in NJ CT850H when I had it. Is there any way I could locate from just that info?? If it\’s free ,why do I have to pay to get the owners name? Want owner to get their vehicle out of my driveway. Unfortunately we cannot assist you with this free license plate number lookup because it does not fall under our allowed circumstances for looking up vehicle owners by license plate number. Your situation is a matter for the police to resolve. Just make sure to give them as much information as possible and they will probably need you to show proof of where you live as well as the vehicle license plate number and information. There is probably a precedence for this situation so it seems like this should be relatively simple to get resolved. License plate Bmc2726 can be found in McDonough Georgia in sable chase apartments area code 30253 it\’s a green Honda accord year 2000. Thank you for reaching out about our Free License Plate Number Lookup blog , we are not certain what it is you’re looking for exactly. Can we assist you with a vehicle record or a VIN check or Vehicle History Report? This is a public record website and your question does not seem to pertain to a public record inquiry. Is there a question about a vehicle public record such as a license plate lookup or VIN check we can assist you with. Are you looking for information about a vehicle that you purchased? Perhaps a VIN check might be of assistance to you. If you provide us with the 17 digit alpha-numeric code we can give you the factory vehicle information that might assist you in locating the correct radio code for your car. Hi, can you tell me what year PA. GAM488 was issued. I\’d like to use it if its 1976 or older. Thank oyou. Thanks for inquiring about our Free License Plate Lookup blog post, we have the ability to lookup vehicle records by license plate numbers or VIN , as well as run vehicle history reports. That being said, we don’t have the ability to lookup what license plate numbers are available for your Pennsylvania car. Your best option is to contact the Pennsylvania DMV directly about what vehicle license plate numbers are available. They can perform a license plate number search for you and let you know what is available. Why are there so few license plate number variations compared with the vehicle identification number? That is a good question about the difference between a license plate number and a vehicle identification number. Read more below to understand how a license plate search works and a VIN check works. Unfortunately we cannot perform that free license plate search for you. Our license plate number search and VIN check resources are reciprocal in their function. That means we can lookup vehicle information with the license plate number or vehicle identification number but we cannot lookup those numbers with a name. That being said, in order to figure out what your plate number is you will want to contact the DMV directly. We have attached a link below to our Free DMV Finder to further assist you with this. We apologize for the inconvenience accessing our license plate lookup resources. You should have received an email with your login credentials. If you cannot find this please reach out to our customer support to further assist you with your license plate number lookup. A license plate lookup will need a license plate number to proceed. It sounds however, that you should probably contact the police when this happens again as we don’t have an affiliation with law enforcement. Our license plate number, VIN and vehicle record resources are for the United States only so unfortunately we cannot assist you with your vehicle records. FYI … UK public records are not nearly as robust as there are in the United States. This is becasuse we have the Freedom of Information Act which allows the general pubic to have access to public information, which is a lot. Point being, you might reach out to some kind of service in the UK that handles these types of inquiries. There is probably a precedence for this. How do I go about looking up and seeing if there\’s anylicense plates or cars in my name that I do not know about. I have no car but keep getting calls from a place saying my manufacturer\’s warranty is about to expire. Our license plate lookup resources are only accessible if you have a license plate number and know the state of registration. What you’re asking is if there are any registered vehicles under your name that you don’t now about. Unfortunately we cannot assist you with that information, you will need to reach out to the DMV in your state to find out about any vehicles registered under your name. As far as the vehicle warranty calls go, make sure to document any information they provide you with. It’s also possible this is just a solicitation call to get you to purchase an extended vehicle warranty. If you are looking for proof of insurance via a license plate number search we cannot assist you with this unfortunately. Proof of insurance must come from your auto insurance company. With many auto insurance companies you can request proof of insurance online or over the phone. Call your auto insurance company or visit their website to obtain proof of auto insruance. Most auto insurance companies allow you to print a “proof of auto insurance card” online or have your auto insurance card emaild to you. You will want to contact the DMV about this issue. If the license plate number on your license plate doesn’t match the information on the vehicle title there is a problem. This can only be resolved by visiting the DMV in person. You can book a DMV appointment or wait in line to talk to a representative about your vehicle registration and the disconnect between your motorcycle license plate and title. I just want to report license plate tampering.2000 Lexus gold in color plates Vzt5908,tages got switched to UXE2140,thoes plates been on there since the first of this year.Car belonging to a Casey Mawyer 18Forrer Rd #102 Stuart\’s draft VA 24477. Thank you for the information about the license plate tampering, which is highly illegal, but you should really report this to the police. We do not have a direct affiliation with the police or DMV so you will need to report this license plate tampering directly. Matt, it really depends on the state in which you registered your vehicle. You will probably need to visit the DMV in person to find out what to do next and get it registered in your name. See below for the most common way a vehicle title transferred when purchasing a used vehicle. When a person sells a vehicle the title transfer is handled by the owner and the seller must send in the release of liability. The title must be signed by both parties and all the relevant fields filled out. The title transfer can then be mailed in, sent online or handed in person. Hi. I’m on the board of my condo. How do I search for the person’s name using the serial number on a handicap placard? You will need to contact the DMV about any disabled person parking placard information. We do not have the ability to search placards such as you mention. It’s possible that the license plate is a specialty license plate but there should still be a state listed on the plate somewhere. If you cannot find it on the license plate then look on the tags, or registration sticker. Hello: My vehicle Taxes have been Paid but haven’t received my decal noting the year on my license plate.i have found an old registration and decal, but it is not accurate. Audrey, you will need to contact the DMV directly about your vehicle registration. Your best and fastest option to get your car registration sticker is to visit the DMV in person. You can also make an appointment with the DMV but many times the DMV is backed up for weeks at a time. You can get pulled over for old registration tags and inaccuracies with your registration can also be problematic. You will want to run a vehicle history report for this type of inquiry. There is a nominal fee for the vehicle history report but it is best practice to obtain a Carfax or perform a VIN check when purchasing a used vehicle. That being said, consider your gut instinct. Many times deals that seem too good to be true are just that. I have been billed for a toll that I am not responsible for. I need to find out who owns this car. Can I use paper print and then laminate it for my licence number plate in California ? In the state of California, the required license plate that is displayed on your vehicle must be issued from the California Department of Motor Vehicles. Unfortunate you cannot legally print up a license plate and laminate and place it on your vehicle. I’m trying to find an old license plate number. I do not have this information, as I have not had the car (or its registration) for several years. I need it to pay a past due EZPass bill in Massachusetts. Please help! My comment to my problem is that of me trying to find out where Kentwood police department sent my plate .this automobile that was retrive 6/23/1999.I don\”t know the license plate number but this is my license #004888702 make of car is a 1979 Cadillac CTS. It sounds like your best option is to contact the Kentwood police department about this issue. We do not have any information to provide you about your vehicle. Hi I wanted to know if it\’s possible look up a license plate number to find the owner will his/her address will expose ? You will need to read and agree to the terms and conditions of the license plate number lookup to obtain any vehicle related information. Some personal information will not be available for security reasons and some information may be limited depending on what state you live in. I am trying to locate an old car that I used to own. Is it possible by using my driver license number from when I owned the car? Many times when you look up a plate it takes a while for info to come up.. Is the paid service much quicker or is it the same? Cindy, it really depends on what type of vehicle record search and what state you are searching in. Our database records search sorts through billions of records so it sometimes takes a minute and is not necessarily faster with our paid service. Priscilla, that is very unfortunate. Hopefully you have uninsured motorist insurance coverage on your auto insurance police so that you can get your car fixed and take care of any medical bills. It’s possible that the license plate lookup you performed contained information from a previous owner. Was the vehicle you purchased used? We do offer free vehicle information with our free license plate search. You can lookup vehicle specs such as make and model and year of most motor vehicles for free. If you would like to find out additional information about a vehicle or other public records then you can sign up for one of our memberships. The more detailed reports cost us money, we can’t give everything away for free. Paula, can you elaborate on what it is you’re looking for with the tag number you’ve referenced? Very convenient to look up to find license plate and car info. Everything seems good after one search. If I need to use it again I hope to find the same quality results on the car info when doing a LP search. I would recommend, very useful when doing a plate search. Easy. Something all car owners should use AND anyone purchasing a car looking up a current license plate!! It could save you from so many problems. License Plate Search Rated14.22 out of 5 based on 27 ratings and 27 customer reviews.